I am currently trying different types of diapers, just to see what I like, and because I like variety! One diaper I bought locally from a Meijer store was made by Cutey Baby. I bought two covers (different days), a pack of inserts of theirs to try out, disposable liners, and a wet bag. I’m going to review all three in this post. 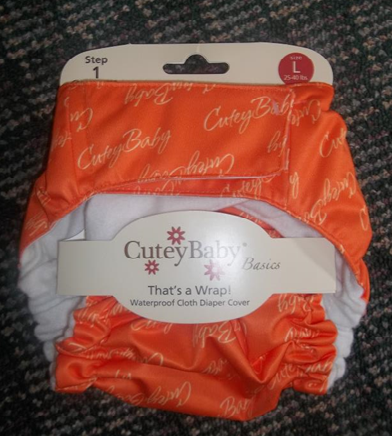 Cutey Baby diapers are promoted on the package as a system. You buy a cover, the inserts (sold as a two pack), and can optionally use the liners. The covers are sized, I think they only come in three sizes, small, medium, and large, and the inserts come in two sizes, small and medium/large. I bought my two covers for $13.99 each, and the pack of inserts was $9.99, if I remember correctly. The liners were about five dollars and the wet bag was also $9.99. Check out their site (link above) for more detailed information. Okay, so when I bought the covers, they only had boyish ones in the size I needed. At first, I had bought a purple one, but it turned out to be a medium and had been packaged wrong. So the next one I got is brown, not terrible, but not the greatest, and the second one is blue with airplanes. That one is pretty darn cute. The rise runs rather small, and the crotch in comparison seems really wide. Sometimes I have to hitch the diaper up in the back on my girl when she gets a quarter moon showing. They have an internal gusset that you stuff the insert into. It does seem to make the rise a little shorter than if it wasn’t there. As far as I know, these only come with hook and loop. The loop is very soft while the loop is a harder plasticky kind that has curled on both of my diapers. Worse on the brown one than the airplane one. Still usable though. It does stick pretty well. You can see in the picture that there’s a little patch of hook next to the loop. I still haven’t figured out what it’s there for. There are no laundry tabs and the hook doesn’t stick very well to the fleece, so you have to stick it the front of the diaper. The fabric has pilled pretty badly on both covers, as you can sort of see in the pictures, on both the outside and inside. The elastic recently went out in the back waist of my airplane cover and I emailed the company about it yesterday, and I was told that they would send me a replacement. So I’m waiting to see what happens. I’ll update and let y’all know when I get it. I did get a very prompt reply. Here’s my two covers. The one on bottom is the one where the elastic has gone out, as you can see. Even before it went out, I think that the airplane cover was a little bigger. Here’s the rear view of the diapers. Front view of the covers. You can kind of see how the hook has curled on the brown cover. The inserts are four layers of microfiber I believe with a stay dry top layer. They’re sewn kind of in a loop, you can see what I mean in the picture. They are very absorbent, I haven’t had any problems using them in the daytime. I haven’t tried them at night. They’re hour glass shaped, with one end being flat. I think I’d like them better if it was round on both ends. The flat part ends up pushing out the cover when you put the diaper on. They are easy to stuff into the cover and I have used them with other covers. They’re easy to clean and I haven’t gotten any stains on them that I haven’t been able to get out yet. Here’s the insert next to the cover. I’m not really sure if the flat end is supposed to go in the front or the back. I usually end up sticking it in the front. Here’s what I mean when I say it’s kind of in a loop. It’s sewn flat at the ends, but it’s not stitched close through all the layers all the way around, if that makes sense. These come in packs of 100. They’re the only brand of liners that I’ve tried, so obviously I don’t have anything to compare them to. I tend to use two of them when I have to use an antibiotic ointment or something similar down there. They’re made out of viscose and are 5” x 12”. They cover my BumGenius stay dry doublers perfectly. I guess they’re pretty soft. They don’t seem to bother my girl’s rear end. They work all right as poop catchers. I don’t use them for that, I just use them when I have to use ointment. I would buy them again, because they are one of the more inexpensive disposable liners I have seen. 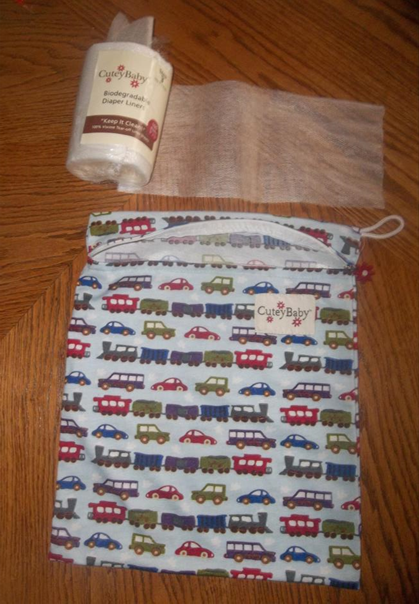 Cutey Baby Wetbag and Liners- Aren’t the cars and trains cute? This is my favorite Cutey Baby product so far! I have the 11” x 14” size. It is the only size the Meijer store carries. I love it! I got a train print. It zips shut and has a little flower zipper pull. It has a little loop of cord on one corner. I can fit about three diapers in there for on the go. I have a Bumgenius wetbag that I put the dirties in. The Cutey Baby wet bag would work just fine, it’s just so cute I want to use it for clean diapers. 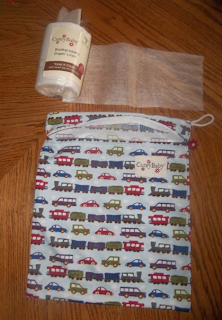 I haven’t had any problems with the fabric on the wet bag pilling and it keeps all wetness and smell contained. I really like having a zipper. Makes it so much easier to open. Cutey Baby has some good products. I think that the design of the diaper covers and inserts could use a little bit of tweaking, like a higher rise on the covers and rounded ends on the inserts, but they are overall good as they are. I admit, they’re not my favorite diaper, but I’d buy them again if I see a print that I really love. The only problem that I’ve had with them is the elastic going out on the back of one cover. They’re a good price and I’m going to try the smaller covers when my new little guy gets here. They’re definitely worth a try. I’ll update this when I receive the replacement cover. So far I am happy with their customer service. I got an email right from Ada Vaughn, the woman behind the brand. Disclaimer: I was not compensated or given anything in return for this review. The views expressed are my own. I will update this with pictures of the liners and wet bag as soon as I find my camera which my daughter has hidden somewhere. Wow, I don’t think I’ve ever seen a diaper that exposed the insert like that. Interesting. I think that would confuse a lot of people into thinking microfiber can go against the baby’s skin. Yeah, it could get confusing. There’s a stay dry layer on top of the layers of microfiber, so no microfiber actually touches the baby’s skin. It does bunch up though, and the edges get out from under the inner gusset, so there is a chance of it ending up against baby’s skin. We haven’t experienced any problems with it though. Lots of diapers have an exposed insert. I actually much prefer it to pockets because you can keep reusing the cover if it’s only peed in. Most people call them all in two’s. That’s the whole deal with Flip and Grovia, two of the biggest diaper manufacturers. I know Grovia uses a cotton insert, but doesn’t Flip just use plain ol’ BG microfibers? I love Ai2s! I have several. I especially love Bummis’ new duo Ai2. GroVia has several types of inserts. Hemp, cotton, and microfiber topped with fleece. Flip has its own inserts topped with fleece, along with cotton day and night inserts. BG inserts can’t be used against the skin, as they are completely microfiber, with no fleece. They’re designed to be used in a pocket.